With the launch of Android Go phones imminent, it’s only natural that Google will be updating many of its apps to run on phones with lower hardware specifications. Android Go, which was announced last year, will be released in phones launching this month in India, with “Go” or lite versions of various Google apps making an appearance on the internet. After Maps Go, YouTube Go, it’s Gboard that has come in for some Go treatment from Google. Gboard Go was spotted by Android Police which revealed that the app is compatible only with devices running Android Oreo 8.1 and feature low RAM. The app is not available on the Google Play Store for normal users and you will not have any luck sideloading the app if you’re not running the latest version of Android. The lite version of Gboard can be installed alongside the standard app and looks almost similar to the full app. Android Police reports that Gboard Go features gesture typing, integrated search, themes, and a full directory of emoji, just like the main app. It, however, misses out on features like stickers and GIF search. The real advantage of Gboard Go, besides being one-third in size compared to the main app, is the low consumption of RAM. 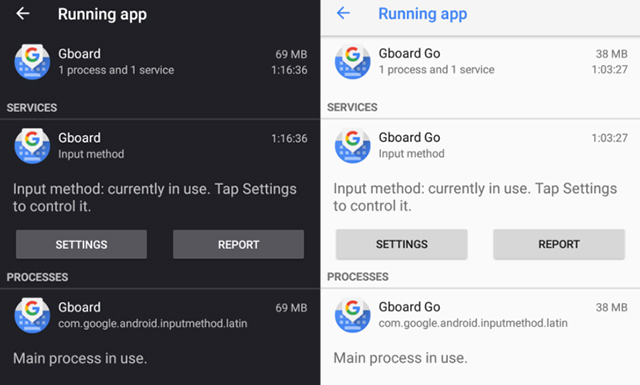 Android Police reported that Gboard Go uses 38 MB of RAM compared to the normal version which uses almost double, at 69 MB of RAM. Low RAM usage is the principal attribute using which Google is advertising Android Go on and yet another Go-branded app pays credence to the fact that Android Go devices are just around the corner. Further, it only runs on Android 8.1, suggesting that Android Oreo Go will already be released with the latest version of Android. Wanna give Gboard Go a try? You’ll have to make sure that your smartphone is running Android 8.1 and is rooted. Then you’ll be needed to edit the build.prop file to fool Android into believing that you’re running a low RAM device. If that’s not too much of pain for you, you can download the APK from APK Mirror.